Quite why composers started to set words from the Lamentations of Jeremiah in Latin in the mid-sixteenth century is unclear. Certainly they had to strike out in new directions. They had to move away from the Mass, Magnificat and Antiphon compositions which had dominated the years of Henry VII and the early years of Henry VIII. Edward VI’s Protestant regime had no need for music in Latin but Mary encouraged it as a sign of her re-unification with Rome. 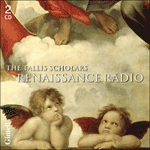 Queen Elizabeth I seemed content with music in both Latin and English. 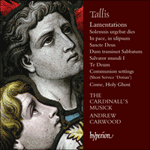 There are ten Lamentations settings from composers working in England in the mid-sixteenth century and, although there is a Continental tradition which pre-dates them, these are the first English examples. All of them have an opening section which states from where the words are taken, and all of them use the Hebrew letters which are printed in the Bible at the beginning of each verse. Each setting (except one) also concludes with the phrase ‘Jerusalem, Jerusalem, convertere ad Dominum Deum tuum’ (‘Jerusalem, Jerusalem, turn to the Lord your God’). This is exactly how they are required to be sung during the Holy Week Tenebrae services in the Catholic rite and the obvious conclusion therefore is that they were written for the reign of Queen Mary. However there are difficulties with this assumption. Two settings by Robert White are written in a style which seems to hearken back to the pre-Reformation, including the use of the high treble voice, but there are moments when he seems to use a more modern style. 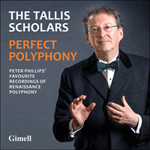 Thomas Tallis and Osbert Parsley both use a lower scoring but both appear to be in a style more in vogue during the reign of Elizabeth in the 1560s rather than under Mary in the 1550s. All three composers use texts in accordance with the liturgical requirements. William Byrd also uses the lower-voice scoring but makes changes to the text; his setting is clearly a product of his early years. 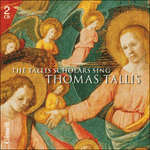 Indeed there is some suggestion that he wrote it under the tutelage of Tallis and so it is unlikely to date from before 1560. John Mundy provides the latest setting (published in 1585). He is the most unconventional of all them, using some verses from outside the Book of Lamentations and omitting the final exhortation. There are also four sets by Elizabeth’s Italian spy-composer Alfonso Ferrabosco, all in a Continental style, efficient and consistent in their use of voices and text setting. On ne sait pas vraiment pourquoi des compositeurs commencèrent à mettre en musique des textes des Lamentations de Jérémie en latin au milieu du XVIe siècle. Ils devaient certainement adopter de nouvelles orientations. Ils devaient s’éloigner de la Messe, du Magnificat et des antiennes qui avaient dominé les années de règne d’Henri VII et les premières années de celui d’Henri VIII. Le régime protestant d’Édouard VI n’avait pas besoin de musique en latin mais Marie l’encouragea comme signe de sa réunification avec Rome. Elisabeth Ière semblait satisfaite de la musique en latin comme en anglais. Il y a dix textes de Lamentations mis en musique par des compositeurs travaillant en Angleterre au milieu du XVIe siècle et, bien qu’il existe une tradition européenne qui les antidate, ce sont les premiers exemples anglais. Ils comportent tous une section initiale indiquant d’où proviennent les textes et, ils utilisent tous les lettres hébraïques imprimées dans la Bible au début de chaque verset. Chaque musique (à l’exception d’une seule) s’achève aussi sur la phrase «Jerusalem, Jerusalem, convertere ad Dominum Deum tuum» («Jérusalem, Jérusalem, tourne-toi vers le Seigneur ton Dieu»). C’est exactement ainsi qu’ils doivent être chantés aux offices des Ténèbres pendant la Semaine sainte dans le rite catholique et on peut donc en conclure à l’évidence qu’ils furent écrits pour le règne de la reine Marie. Toutefois, cette hypothèse pose des problèmes. Deux musiques de Robert White sont écrites dans un style qui semble revenir à la pré-Réforme, avec l’utilisation de la voix de soprano aiguë, mais il y a des moments où il semble adopter un style plus moderne. Thomas Tallis et Osbert Parsley adoptent tous deux une écriture dans un registre plus grave mais dans un style qui semblait plus en vogue sous le règne d’Elisabeth dans les années 1560 que sous celui de Marie dans les années 1550. Les trois musiciens utilisent des textes appropriés aux critères liturgiques. William Byrd utilise aussi les voix graves mais modifie le texte qu’il met en musique et c’est clairement une œuvre de jeunesse. En effet, certains pensent qu’il aurait écrit cette musique sous la tutelle de Tallis et il est donc peu probable qu’elle soit antérieure à 1560. John Mundy nous donne la musique la plus tardive (publiée en 1585). Il est le moins conventionnel de ces compositeurs, utilisant certains versets qui ne font pas partie du Livre des Lamentations et omettant l’exhortation finale. Il y a aussi quatre mises en musique du compositeur-espion italien d’Elisabeth, Alfonso Ferrabosco, toutes dans un style européen, efficaces et homogènes dans leur utilisation des voix et la mise en musique des textes. Warum diverse Komponisten ab der Mitte des 16. Jahrhunderts die Klagelieder Jeremias in lateinischer Sprache vertonten, ist unklar. Sicherlich mussten sie neue Wege einschlagen. Es galt, sich von den Mess-, Magnificat- und Antiphon-Kompositionen loszulösen, welche unter der Herrschaft Heinrichs VII. und der frühen Herrschaft Heinrichs VIII. vorrangig waren. Unter der protestantischen Herrschaft Eduards VI. gab es keine Verwendung für Musik in lateinischer Sprache; Maria jedoch förderte eben dies, um damit ihre Wiedervereinigung mit Rom zu untermauern. Elisabeth I. schien Werke sowohl in lateinischer als auch in englischer Sprache gutzuheißen. Es gibt zehn Vertonungen der Lamentationen aus der Feder von Komponisten, die um die Mitte des 16. Jahrhunderts in England tätig waren, und obwohl auf dem europäischen Kontinent derartige Werke noch früher entstanden waren, sind diese die ersten englischen Werke. Alle beginnen mit einem Eröffnungsteil, der den Ursprung des Texts angibt, und in allen werden die hebräischen Buchstaben verwendet, die in der Bibel zu Beginn eines jeden Verses stehen. Alle Vertonungen (mit einer Ausnahme) schließen zudem mit dem Satz „Jerusalem, Jerusalem, convertere ad Dominum Deum tuum“ („Jerusalem, Jerusalem, bekehre dich zu Gott, deinem Herren“). Ganz genauso sind sie auch in den Karmetten gemäß des katholischen Ritus zu singen, so dass die Annahme naheliegt, dass sie unter Königin Maria entstanden sind. Allerdings ergeben sich mit dieser Annahme verschiedene Schwierigkeiten. Zwei Vertonungen von Robert White sind in einem Stil gehalten, der sich offenbar auf die Vorreformationszeit bezieht—so etwa der Einsatz des hohen Knabensoprans—, doch gibt es auch Momente, in denen er sich eines moderneren Stils zu bedienen scheint. Thomas Tallis und Osbert Parsley verwenden beide eine tiefere Besetzung, scheinen sich jedoch eher an einen Stil zu halten, der in den 1560er Jahren unter Elisabeth en vogue war, und nicht so sehr in den 1550er Jahren unter Maria. Alle drei Komponisten verwenden Texte entsprechend der liturgischen Anforderungen. William Byrd setzt ebenfalls tiefere Stimmen ein, nimmt allerdings Veränderungen an dem Text vor, den er vertont, und man kann mit einiger Sicherheit davon ausgehen, dass es sich bei dieser Komposition um ein Frühwerk handelt. Es ist sogar angenommen worden, dass er es unter der Anleitung von Tallis schrieb, so dass es wahrscheinlich nicht vor 1560 entstanden ist. Von John Mundy stammt die jüngste Vertonung, die 1585 herausgeben wurde. Er verhält sich am unkonventionellsten, indem er einige Verse verwendet, die nicht aus den Klageliedern stammen, und zudem die letzte Anrufung weglässt. Der italienische Spion-Komponist Elisabeths, Alfonso Ferrabosco, komponierte ebenfalls vier Vertonungen, alle im kontinentalen Stil, wirkungsvoll und konsequent in der Besetzung und Textvertonung. she is now subject to others. and have become her foes. turn to the Lord, your God. la ville jadis pleine de monde. mais ressemble à présent à une veuve. elle se courbe à présent devant d’autres. et les larmes roulent sur ses joues. il n’y a personne pour la consoler. et sont devenus ses ennemis. tourne-toi vers le Seigneur, ton Dieu. die einst so dicht bevölkert war. und Tränen benetzen ihre Wangen. und sind ihre Feinde geworden. wende dich dem Herrn, deinem Gott, zu. omnes amici eius spreverunt eam et facti sunt ei inimici. all her friends have spurned her and have become her foes. turn to the Lord your God. The 1560s saw a vogue in England for motets based on the biblical book of Lamentations. Robert White, Osbert Parsley, the young William Byrd and Thomas Tallis all turned to these texts, perhaps in a quest to write highly expressive music. 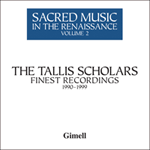 Tallis’s first setting starts by introducing itself: ‘Here begins the lamentation of the prophet Jeremiah’. 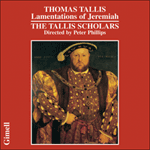 Musical settings of the Lamentations traditionally include the Hebrew letters that preface each verse of the text – hence the word ‘Aleph’ before the first verse of Tallis’s Lamentations. 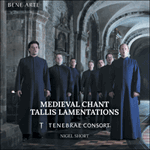 Tallis’s music for the second Lamentation verse starts with the Hebrew letter ‘Beth’; and it ends with stern advice: ‘Jerusalem, turn to the Lord your God’.